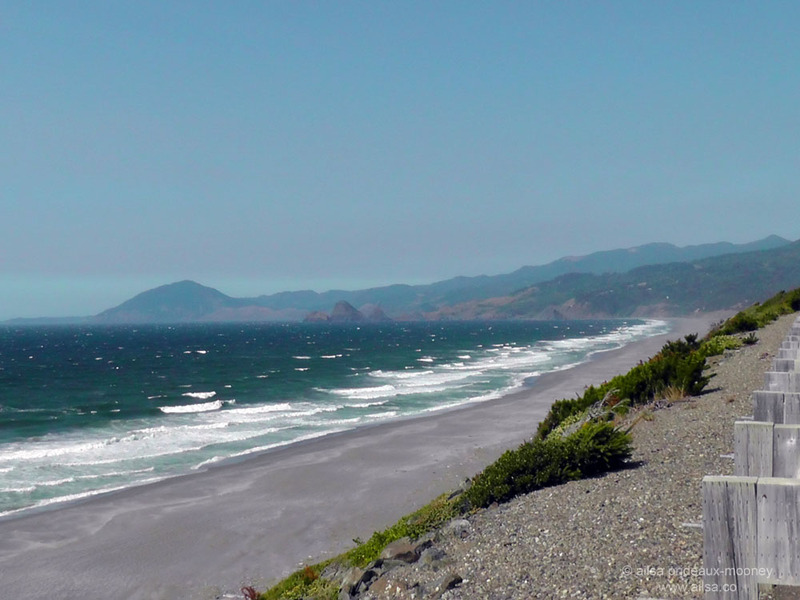 US road trip day 21 – Freeway watching along the Oregon Coast | Where's my backpack? I woke up face down on my laptop and it took a few moments to remember where I was. Jill had disappeared and I was all alone in the flickering fluorescent laundry room. It was still dark outside as I made my way across the wet grass towards the lonely little tent pitched by the side of our truck; just the faintest of grey suggested the onset of dawn. A glance inside the tent found Jill huddled up and sound asleep inside her sleeping bag. It was bitterly cold so I crept into my sleeping bag too and tried to fall asleep again, but to no avail. Instead, I pulled out my now well-worn copy of Travels with Charley and read the penultimate chapter by the focused beam of a little book light until daylight spread through the camp site and the RV generators began stuttering into action all around our tent. Jill stirred, roused by the sudden clatter and we both emerged from the tent looking like death warmed over, with matted hair, pale faces and startled expressions. The site was bereft of life; everyone was still safely tucked up inside their RVs, so we pulled out our camping chairs and sat there in silence, shattered from the lack of sleep and thankful the sun was driving away the previous night’s chill. Every inch of me wanted to pile everything in the truck and hit the road just as soon as possible, putting last night far, far behind, but Jill had the look of a woman in need of insane amounts of caffeine before even thinking about action. I put some water on for coffee, then dragged myself over to the restrooms to brush my teeth. In the mirror I noticed my right cheek bore the imprint of my laptop keyboard; neat little squares ran from the corner of my eye down to my jawline. An oddly elongated rectangle stood out in sharp relief and annoyed me with its irregularity until I figured out it was the shift key. Jill had the coffee brewing by the time I returned, so I slipped back into my chair and we sat, savouring each earthy sip and commenting upon the escapades of the previous day. We sat side by side, our chatter interspersed with lapses of silence and deep, contented swigs of coffee, all the while staring past the RVs that were encircling out tent; our gazes firmly fixed on the horizon where there should have been a glorious view of the Oregon Coast, if it hadn’t been for the elevated freeway that blocked every last inch of it. Cars zipped along merrily as we watched; first a red one, white motorbike, black, another red one, ooh, a truck. Minutes turned into an hour, then two. RVers popped out occasionally, scurrying over with armloads of laundry to the place we had slept for most of the night and then scuttling back across the grass, nodding awkward hellos at the two tent campers who refused to leave. We made another pot of coffee and settled in to watch more freeway. It was as if last night had sucked the life out of us. I glanced at my cellphone. It was almost 3pm. When I told Jill, she burst out laughing. “This is the longest we’ve hung out at any camp site. How ridiculous that we chose this one.” I laughed too. “It’s the freeway,” I said, “I can’t stop watching it.” With that, we drained our cups and got to work. As we were breaking down the tent, there was a loud twang and one of the flexible poles crumpled into about twelve little pieces. There was no saving it, but we packed it up anyway and thanked our lucky stars that we had brought a second tent. When we were finished, we drove the truck over to the reception building which was now open for business and went inside to pay. The woman behind the desk was genuinely confused. “Are you checking in or checking out?” she asked Jill. “Checking out” said Jill with a slight edge to her tone. “But it’s 3pm” the woman said stiffly. “Were you out surfing?” “No” said Jill, the edge increasing ever so slightly. I saw where this was headed. “We were watching the freeway” I jumped in with a big smile. “Oh, is that your dog? What a cutie” I added, with every inch of charm I could muster. In my defense, the dog was genuinely adorable, but I was also aware of the rising tension and the distinct possibility that the woman might try to charge for two nights. I didn’t want to have to bail Jill out should the woman suggest anything of the kind. Jill glanced at me, wryly amused, knowing full well what I was doing. The woman cheered up noticeably. “He’s mine” she grinned proudly, throwing him a rubber ball and charging us for one night. After a quick pit stop to refuel the truck we hit the road again and I breathed a sigh of relief to have escaped the circle of RVs that had somehow vaguely reminded me of Stonehenge; the RVs standing in for sarsen stones and our little tent taking the place of the central sacrificial altar. Shaking off the claustrophobia of Winnebago-henge, I turned my attention to the dazzling glimpses of coastline that now danced by outside our windows. The Oregon Coast is truly lovely, even on a hazy day. Dark, craggy rocks jutted out of the sparkling ocean and miles of pristine beach spread lazily along the roadside. Wildflowers danced in drifts, stirred by the sea breeze. We took our time along the road, stopping several times to get out, kick off our shoes, wander along short stretches of beach and let the waves lap at our feet. In Bandon, we stopped for lunch and an amble along the boardwalk. Gulls flocked overhead and brightly-coloured boats bobbed gaily in the small harbour. 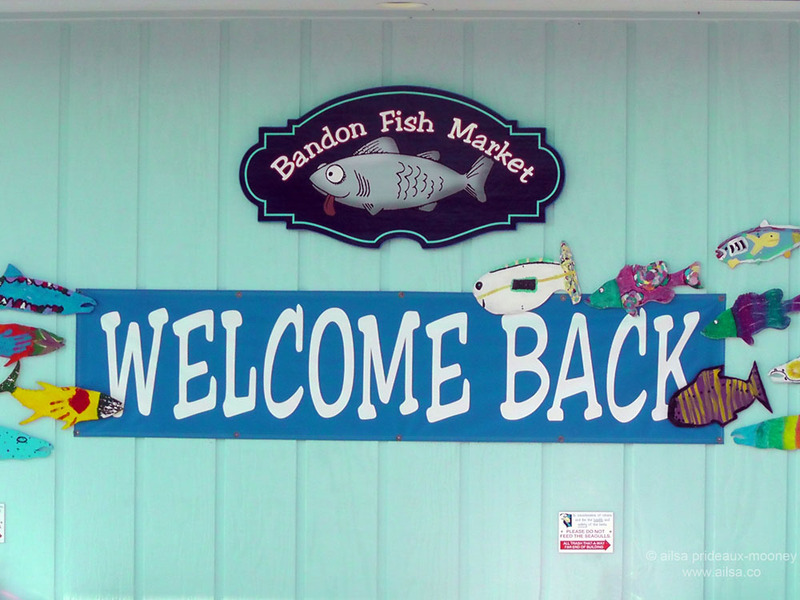 Bandon is the quintessential seaside town; I would love to have spent more time there. It was founded by Irish settlers from Bandon, Ireland; hence the name, and is often referred to as Bandon-by-the-sea which smacks of old world seaside grandeur. Cranberries and cranberry products featured prominently in shop windows. Intrigued, I asked a store keeper and was told of a settler named Charles McFarlin who arrived in 1885 armed with cranberry vines and set about seeking his fortune, turning Bandon into the Cranberry Capital of Oregon. The cranberry industry is still going strong today; the area harvests about 30 million pounds of berries annually. Cranberry bogs surround the town and Faber Farms offer free tours from June to November. Sadly we hit town just a little too late in the day to take a tour, but next time I’m there, I will make sure to visit. This oddly cool little town even has a Cranberry Festival which takes place during the second week of September and features a cranberry eating competition and a cranberry parade. 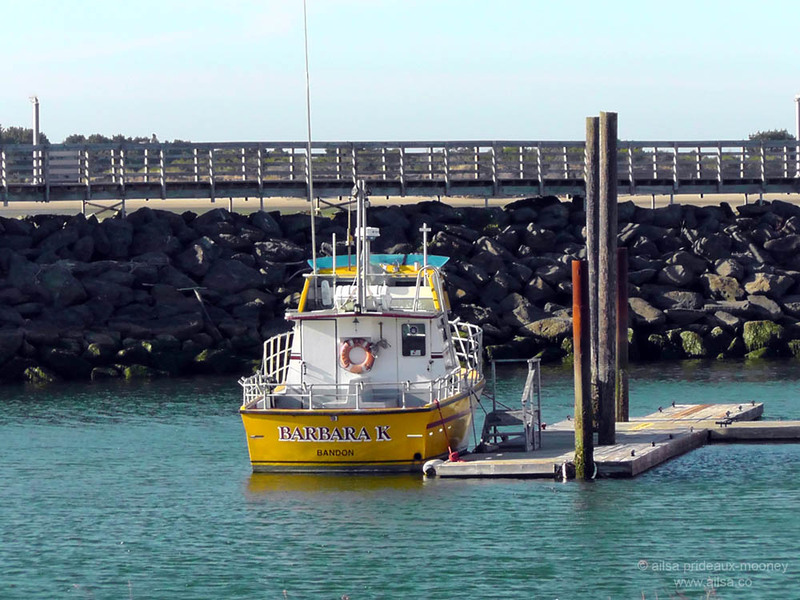 Leaving Bandon, we wound our way northward, past Coos Bay, heading for the Oregon Dunes. Trees now lined both sides of the road and the sun was beginning to set so we hurried further along in search of a place to camp for the night, hoping to do so in time to watch the sun go down over the ocean. We turned in at the first camp site we found and drove right past the office and camps sites, straight out to the dunes along Siltcoos Beach where we parked the truck and clambered over the huge sandy mounds until the ocean came into view. Then we plonked ourselves down in the sand at the crest of one of the bigger dunes, sheltered from the wind by tufts of sedges, reeds and grasses and watched the sun disappear in a haze of dusky lavender and streaks of rosy pink. 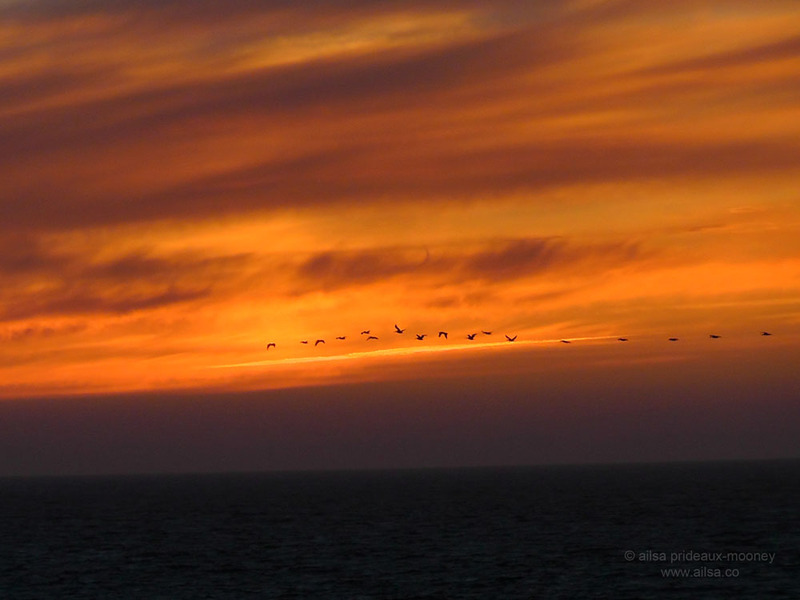 Just before the light gave out, a flock of geese skimmed languidly across the horizon. Watching them drift by was the most resplendent way to end a day. 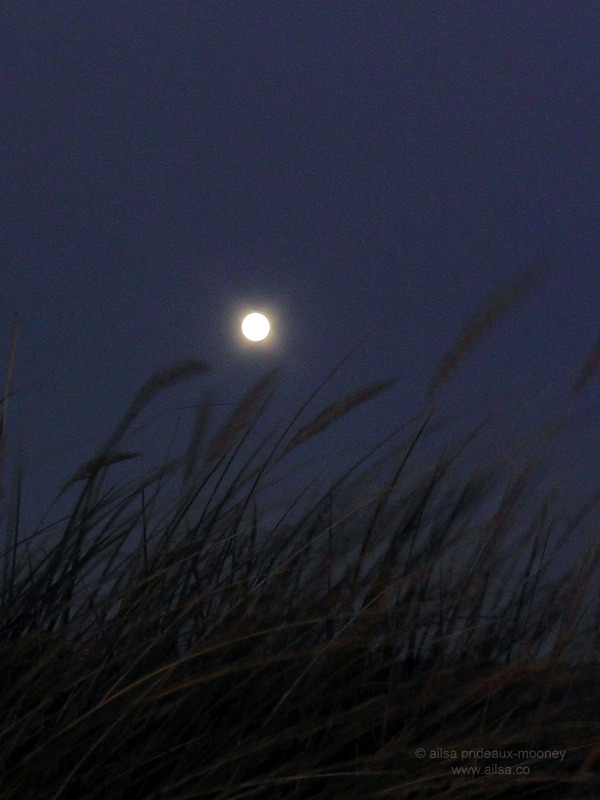 We stayed seated until the moon rose high above the tall grasses and then slowly made our way back down the dunes to the truck. At the bottom of the dunes we noticed a sign warning of unusually high sneaker waves, something neither of us had heard of before. They are disproportionately large waves that materialize without warning and the signs made it clear in no uncertain terms that if a sneaker wave gets you, you’re going down, permanently. The surging wall of water is saturated with sand and within moments it can engulf you in what feels like liquid cement. These deadly waves claimed five lives along the northern California Coast last winter alone. Never turn your back on the ocean around here. We drove back to the camp site to find out they didn’t cater for tent campers, but after our experience the night before we weren’t even remotely put out. We just drove a little further along and found a forested state park which backed directly onto the dunes. It was thrillingly quiet, with lots of open sites so we chose a lovely spot right by the dunes and pitched the new tent like seasoned professionals. We were in heaven; not even the strangely androgynous park ranger, with gleaming eyes like Jack Nicholson in The Shining and an unnerving habit of popping out of the dark to check on us, could dampen our spirits. We had finally found the perfect camp site. We struck up a campfire, feasted on chips and spicy hot salsa, broke open not one but two bottles of fine red wine and talked into the wee small hours. The moon was high overhead when we finally turned in and drifted off to sleep to the sound of the waves, sneakers or otherwise, crashing against the shore on the other side of the dunes. This entry was posted in Oregon, Photography, Travel, United States and tagged humor, inspiration, nature, photography, photos, pictures, travel, writing. Bookmark the permalink. Beautiful collection of a pretty stretch of the coast. I’m glad you escaped Winnebagohenge -chuckle- and found the great state park beach campgrounds here. loved the video, very chilled and beautiful…..no end to your talents Ailsa! I’ve just read this post and the previous one. I really admire you, Ailsa, for writing about your life as you’re living it. Some people say they can sleep anywhere; now you are one of them! Haha, true, Trish, I must have been pretty exhausted to use my laptop as a pillow! I love the picture of the geese – we saw something very similar on the way to work the other morning, and Aaron wished he had his camera there to capture it. And I laughed out loud at Winnebago-henge and the shift key indent on your face 🙂 You do have some great stories! Lovely photos and a fun post to read! Ailsa- spectacular photos- I have never seen the Oregon coast- the first reminded me of an ancient pic of the Loch Ness Monster submerging-!! Those rocks are seriously cool, vastly, they pepper the coast all the way along, some of them tiny and some of them gigantic. 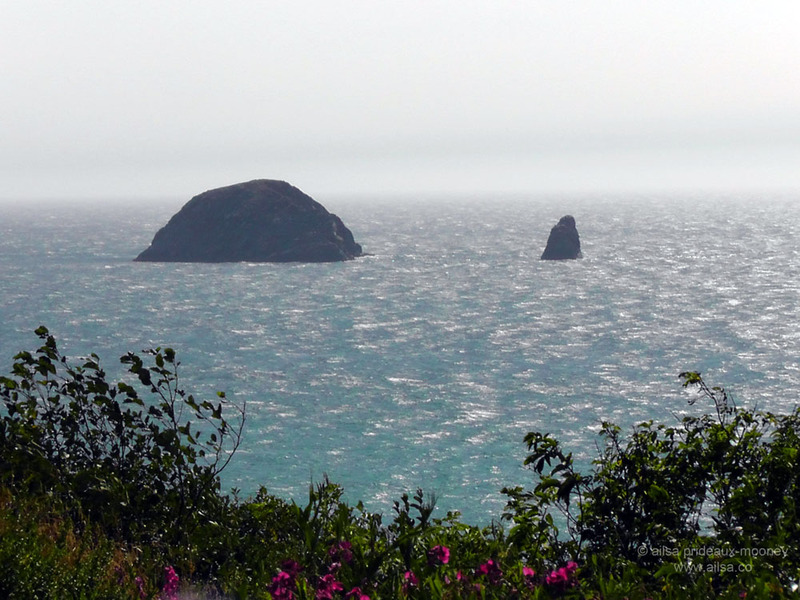 Together, they form part of the Oregon Islands National Wildlife Refuge – there are 1853 rocks, reefs and islands that span 320 miles of coastline. Amazing to see. Yes! vastly curious..I had much the same thought. Oh Ailsa! you do have a way with words…and here I am again in the library trying to control my laughter. Laughter is meant to be heard!! I need to get back to the Oregon coast, it’s been a long while and I miss those views. Thanks! So glad you got out of that laundry room! 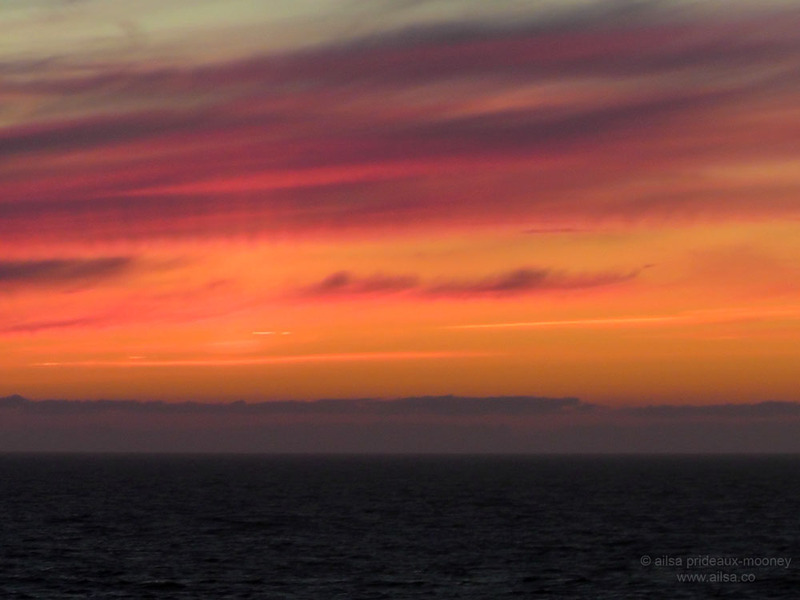 love seeing the Lost Coast, the Oregon Coast & reading your adventures …& appreciate your sense of humor! great photos & writing. I would feel compelled to kayak out to those rocks in the sea and explore them. Love your tale and the pictures. A great post! Made even better by the writings. Great photos!! Yaay, thanks John, so glad you enjoyed it. It was an awfully fun day. A great sense of humor is essential when camping. You’ve got it. Thanks for your very entertaining blog. Keep on writing…. We camp in a tiny trailer – check it out at http://www.campshaws.com. Has anyone ever spent a non-foggy, warm night in Gold Beach? I don’t think so. You’re almost to my favorite part of the Oregon coast. I’m waiting impatiently – I hope you liked it as much as I do! Oh boy, the Oregon Coast is really stunning, I loved every minute of it! Of all the places I’ve travelled, the Oregon Coast is still at the top of my list of favourites. Stunning scenery around every turn, wide virtually deserted beaches, and no sales tax! Love your pics. Glad you found a nice state park campground. My hubby is a tent camper and he liked the locations of many of the Oregon State Parks – they were great for tents and really well maintained! I really fell in love with the Oregon Coast, I’d been to the very northern part before but never travelled the length of it. It’s just beautiful. Wonderful post again … are you still on the road – you two ???!!!! US has everything when it’s about nature … my favorite shot of this fantastic bunch is the red sky and the geese. What a journey you’re on. Oh viveka, I knew there were some wonderful places out there on the road, but I had no idea how many extraordinary and diverse landscapes we would pass through. It’s just too beautiful for words. US are an amazing and big country .. has everything when it’s about nature and it shifts depending what in what part of the country you are. I’m very bad, because I have seen very little of my own country. I had never been to Stockholm as a tourist before I moved aboard. I felt like I was there! I love the campsite story. Gorgeous photos. The flock of birds is amazing. Oregon Coast is even more beautiful through your lens. Thanks Ailsa! I’ll join everyone else in cracking up over the new word you coined – Winnebago-henge. It wouldn’t surprise me to start finding it in common usage. It certainly pegs the RV cult pretty much. Thanks for taking us along on your trip! I love the photos! I love how you describe your days filled with lows and highs. It always seems that no matter what happens in the end you come across a beautiful vista and all is right with the world again. I read out a bit of the previous post to my husband and ended up reading the whole of both posts out loud! We were laughing our heads off about the keyboard imprints and your response to the woman behind the counter in the RV site. You must have been very charming for her not to take “we were watching the freeway” as sarcasm! Along with your other followers, I’m loving this road trip! Girlfriends are the best! What a GREAT post — thoroughly enjoyed! How I know what it’s like to pitch a tent in the midst of RVs. Watching the mesmerizing highway and the dents from the keyboard – priceless! I really enjoyed this little “adventure” with you! The Oregon coast is beautiful and unique, and your pictures are beautiful! 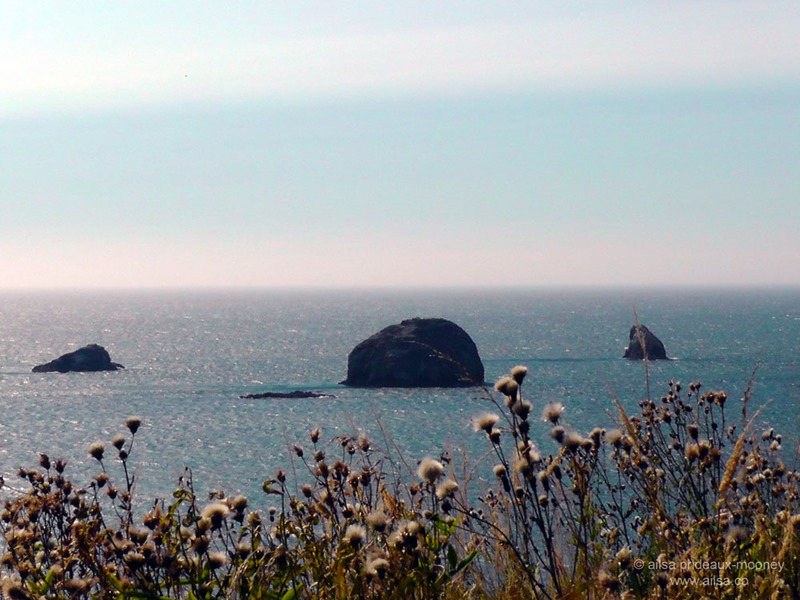 I’m not much of a camper, but I do love road trips, and we have travelled the Oregon coast – it is beautiful! Safe travels to ya! – looking forward to your next adventure!